By now you’ve learned to play a few tunes on the mandolin. You know some of your basic chords and you’d love to be able to play with other musicians in a jam, but you’re “chicken.” That’s because up to now, you’ve just been playing by yourself in the closet, so to speak. Well, it may be time to walk proudly out of the closet and into the limelight. Or, on the other hand, you may need to go deeper into your closet, pulling a coat down over your head (just kidding). Let’s take this little test to see if you’re “jam-worthy.” Can you 1) Play about a dozen bluegrass standards all the way through without flinching, breaking a sweat, and getting out of time? 2) Do you know the difference between a “chord” and a “key?” 3) Can you play in all the common keys like G, A, D, C? What about the more difficult bluegrass keys like B, B flat and E? 4) Do you know how to back up a singer? 5) Do you understand proper jam etiquette? Before we look at your test score, let’s pick these test questions apart. 1) Bluegrass Standards: A list of bluegrass standards are those songs that are commonly known in your particular area or region that you’d likely hear at a local jam session. These standards are the bedrock songs by such artists as Bill Monroe, Flatt & Scruggs, the Stanley Brothers, Jim & Jesse, Jimmy Martin, Reno & Smiley and maybe the Carter Family. That seems clear enough, but unfortunately, in any particular area, standards change, and what is a well-known song in one area, may be completely unknown in another. The best way to prepare for a jam is to visit that jam without your mandolin and scope out the songs that are commonly played. Make a list of the songs that you hear. 2) Let’s make sure you understand the difference between a chord and a key. A chord is nothing more than several notes that sound good together. The notes blend and harmonize with each other. A chord is usually made up of just three notes, although partial chords of two notes are commonly used on the mandolin. It’s easy to find books of mandolin chords in a music store. However most of these chord books present too many complicated chords, so the task of learning mandolin chords suddenly becomes insurmountable. I recently wrote a little article on this web site which has some very simple chords, just the right number of chords you need to get started. Check it out. Rather than relying on chord books or the internet, you really need to understand how to build your own mandolin chords. It’s really fairly simple, so stick with me on this. In order to build your own chords, you’ll need to know a wee bit of music theory. Here are some common scales showing the sharps or flats, if any. A Scale (3 sharps): A, B, C#, D, E, F#, G#, A. C Scale (0 sharps): C, D, E, F, G, A, B, C.
D Scale 2 (sharps): D, E, F#, G, A, B, C#, D.
E Scale (4 sharps): E, F#, G#, A, B, C#, D#, E.
F Scale (1 flat): F, G, A, Bflat, C, D, E, F.
G Scale (1 sharp): G, A, B, C, D, E, F# G.
So how do you use this information? Major chords normally are made up of three notes, which are given the numbers 1, 3 and 5. Take a C scale, for example, which has no sharps or flats. If you give every note of the C scale a number, it would go C=1, D=2, E=3, F=4, G=5, A=6, B=7 and C=8. Right? So of the 1, 3, and 5 notes that make up the C chord, the 1 would be C, the 3 would be E, and the 5 would be G. So those three notes make up a C chord: C, E and G. It’s as simple as that to find your own C chords. If you remember which scales have sharps or flats, it’s nearly as easy to figure out how to make up your own A or G or F chords. Just count up on each scale, using the sharps and flats, if any, to make your 1, 3 and 5 chords. Why is this information useful in a jam? In addition to playing individual notes, mandolin players frequently play two or even three different notes at the same time for licks, fills and solos or breaks. These two or three notes are chords, so you need to understand how to make up your own chords. For example. Let’s say you’re playing a song that uses a G chord. While on that G chord, you play a G note. Maybe you think that G note sounds a little lonely, and you want to surround it with a harmony note or two. What do you do? You play one or two other notes of the G chord. So the 1 of a G chord would be a G. The 3 of a G chord would be a B, and the 5 of a G chord would be an D. So along with your lonely G note, you can play a B and/or an D. Got it? 3) Now let’s talk about what is a “key.” You’ve overheard musicians say stuff like, “boys, this is gonna be in the key of B.” Now you’re going to find out what they’re talking about. A key tells you several things: the scales and the chords that are used to play a particular song. Think of a key as a little family of chords. Like a regular family, the chords in a key have a relationship to each other, and each is given a number. In bluegrass type music, the most common family of chords or key are 1, 4 and 5. Remember those numbers. So in the key of A, for example, A=1, B=2, C=3, D=4, E=5, F=6, G=7 and A is also 8. So the 1, 4 and 5 for the key of A would be A (1), D (4), and E (5). Right? Now you know how to figure out the three chords that are used in any key. What have we learned in this article? Hopefully, you understand a little about “bluegrass standards.” You’ve learned about scales, chords and keys. You’ve got your feet wet. In future articles, we’ll cover other coping skills you’ll need in a jam. 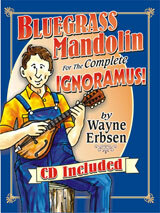 In the meantime, I’d highly recommend my new book, Bluegrass Mandolin for the Complete Ignoramus! Its friendly style and easy songs makes learning the mandolin fun and nearly painless. It comes as a set with a CD with 90 tracks where I play each melody very slowly and clearly on the mandolin. I’m so sure that you’ll like the book that I’ll offer you this guarantee. If you purchase the book and CD ($19.95) and either don’t like it or don’t get anything of value out of it, return it, and I’ll send you a check. Just tell me how much you paid for it. I only ask that you USE the book first. Fair enough? 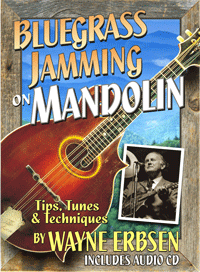 My newest book, Bluegrass Jamming on Mandolin is now available!!! This fun book teaches 31 easy bluegrass jam favorites and covers how to play with others, how to improvise, how to make up your own licks and fills, and pretty much everything you’ll need to march confidently into your next jam or picking session.